Deloitte has announced its ranking ‘Sweden Technology Fast 50’, 2018. Strossle ended up as the second fastest growing company, meaning they beat companies like iZettle, Storytel and Trustly. The ranking also means Strossle will be nominated to EMEA Fast 500, listing the fastest growing technology companies in EMEA. Strossle is a media technology company with the vision to help publishers monetize the true value of their content. Since 2013 Strossle has provided the media industry with cutting-edge technologies for content recommendations, native advertising, traffic exchange and GDPR-safe marketing. The media industry’s shift from intrusive banners to native advertising, and from click maximizing to engagement, has clearly played into Strossle’s hands, and is reflected in the company’s turnover. “Revenue growth is the ultimate proof for startups that there’s a real demand for their products, and not only a PR-fuelled hype. 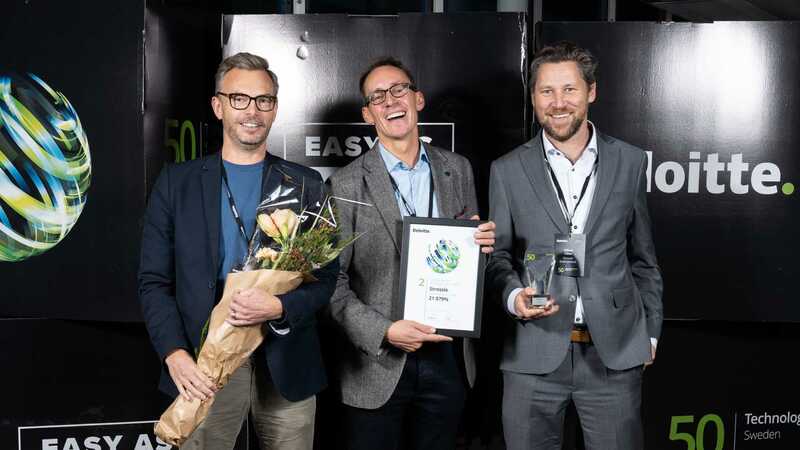 I’m glad that Strossle has achieved five consecutive years with more or less 100% revenue growth, and I want to thank Deloitte for acknowledging this in “Technology Fast 50, says Strossle’s CEO Håkon Tillier. ‘Sweden Technology Fast 50’ is a ranking of Sweden's 50 fastest growing technology companies, based on the growth in net sales over the past four years. The rankings were introduced by accounting giant Deloitte in 1995, and include both public and private companies, covering all types of technology. Strossle is a media technology company helping publishers and brands to attract new visitors, increase user engagement and generate more revenue. At the core is a proprietary platform using machine learning to recommend the most relevant content and ads to the users. The platform has gained international attention as winner of the “Native Advertising Platform of the Year” 2016 (Native Advertising Institute) and “Digiday Media Awards Europe” 2018. Strossle’s revenues are primarily generated from promotion of sponsored content, in a network of more than 1,500 publishers and 750 advertisers. The company was founded in 2013 and has 60 employees in 10 countries.